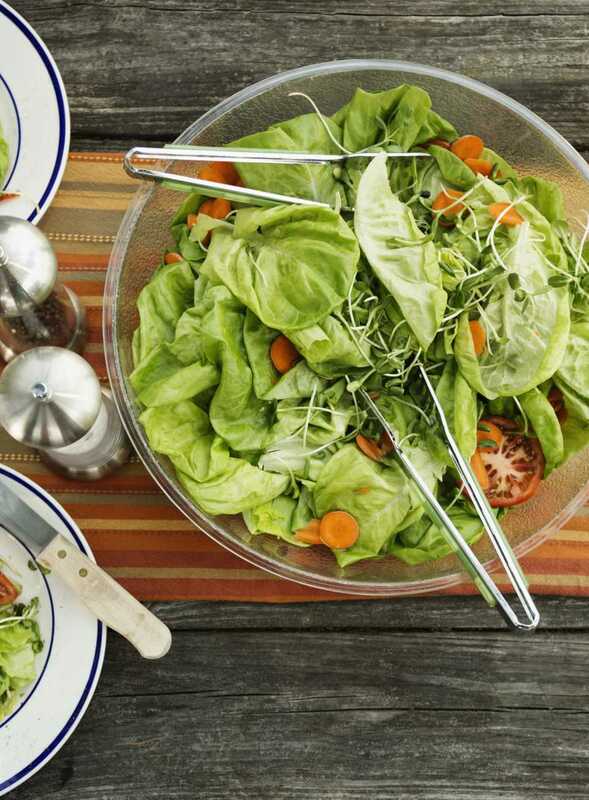 This German cream salad dressing, or salatsauce, is the perfect match for butter lettuce, also known as Boston lettuce or Bibb lettuce, or ​any crisp greens, for that matter. It's an easy three-ingredient, one-bowl recipe. The salad dressing, made with heavy cream or half-and-half, is mixed in the bottom of a bowl with lemon juice and sugar, and then the torn greens are added. The greens are tossed in the creamy dressing to completely envelop them, and the salad is ready to be served. It couldn't get much easier than that. Since the dressing is made without mayonnaise, those with egg allergies can indulge. Many people who have visited Germany come back raving about their salads. Root vegetables often find their way, raw and cooked, into salads, and many people like the fact they don’t mix everything up with the lettuce but include several small portions of different salads on the same plate. In a large bowl, whisk together 1/4 cup heavy cream or half-and-half, 2 teaspoons fresh lemon juice and 2 teaspoons sugar until the sugar dissolves. Add a little milk to thin, if necessary. Add salad greens and tomatoes and any other ingredients shortly before serving and toss to coat. Tip: Use crisp lettuce types to accompany this salad dressing. This salad goes well with Wienerschnitzel or bratwurst. Note: A typical German meal would include some type of salad, like this simple cucumber-dill salad recipe.